A Tipp Hill couple came in to get wedding bands and had certain ideas about what they wanted. 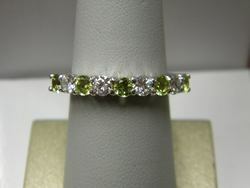 The woman wanted peridot stones mixed in with her diamonds...the pale green giving a slight nod to them living on Tipp Hill. 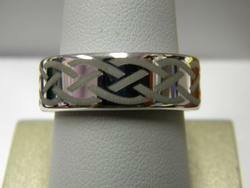 The man chose a band with a celtic scroll to celebrate his "half" heritage and their marriage. Each ring was based on how happy they were - In her words, God brought them together. They were truly blessed.